With the arrival of colorful autumn foliage and falling temperatures signals the chill of winter on the horizon. Although that usually inspires the thought of preparing for the holiday seasons of Thanksgiving and Christmas, Charlottesville homeowners should also be preparing their homes for inclement winter weather as well, often referred to as winterizing your home and preferably done before the winter comes. Winterizing your home entails not only protecting your home from inclement weather but also making it more energy efficient when higher energy use is needed. 1. HVAC (inspecting the furnace/heating ducts, and protecting you’re A/C unit): Get your furnace system inspected to ensure its working efficiently and safely. Also, don’t forget to change your filters regularly. Heating ducts should also be looked at to ensure there is no heat loss from a leak, which can drain you on utilities costs. To protect you’re A/C during its dormant months from freeze damage, remove water from any pipes or pans and keep you’re A/C covered with a plastic cover. 2. Siding or Exterior Painting: Any exposed joints, cracks, or seams near your siding, windows, or doors need to be sealed by caulking with weather-resistant caulk or weatherstripping where needed. Minor problems on your exterior may be patched as a short-term remedy, but if it’s more deteriorated and needs scraping or repainting, take advantage of the last Fall months before Winter for an exterior painting project. On the inside, ensure you have proper insulation in any unfinished areas such as a basement or attic by simply adding more insulation in those areas. 3. Windows & Doors: In addition to ensuring your doors and windows are properly sealed or have weatherstripping, an added measure for energy efficiency is installing storm doors and windows, which are installed on the outside of your regular doors and windows. This can significantly add energy efficiency and save you money on utilities bills. 4. Roof & Gutters: Clean your gutters to prevent clogged gutters from forming ice dams that cause damage from overflowing into your home. To prevent ice dams, clean out the dead leaves and other debris in your gutters so water can drain freely. As an extra precautionary measure, it is also recommended to trim trees that hang close to your home or property in order to prevent gutter debris blockage, roof damage, or property damage from icicle formations. 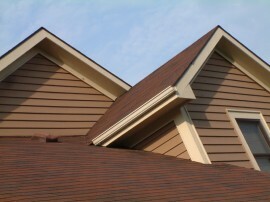 For your roofs, check flashing to ensure water cannot enter the home and replace any worn roof shingles or tiles.